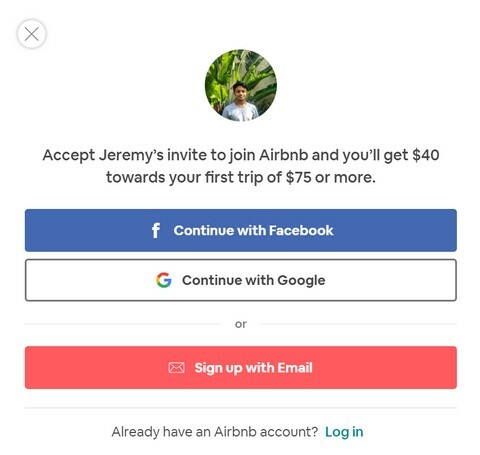 Update April 8, 2019: The Airbnb coupon Code is now worth $55. You get $40 towards an Airbnb rental and $15 for Airbnb Experiences. Want to get A Discount On Airbnb? It’s pretty simple, log out of your current Airbnb account and just click this link and create a new account with Airbnb and you will get $40 Travel Credit for Free! on all Bookings above $75. Airbnb doesn’t really do Coupon codes so the only way to get a discount is through a referral like above! This is the easiest way to avail a huge discount for first timers as you’ll get up to$40 discounts off your first Airbnb booking of over $75 (that’s the minimum). If you don’t have an Airbnb account yet, click this link and sign up and you will get up to $40 off your first stay thanks to the first time Airbnb coupon on your first trip if it’s above $75! NOTE: USE A VPN and change your location to the United States to get the highest Airbnb travel credit you can get! Don’t settle for the $25 most travel bloggers try to push use NordVpn if you want a good one! As of 2019, every single Airbnb coupon code will only offer $40 off your first booking of $75 or more. If you use the tips to get cheap Airbnb that’s probably 2 nights for free. What’s even better is that you can get a straight up $40 Airbnb discount code for your booking? and If you are traveling with friends you can ask them to create new Airbnb Accounts with the link above and get even more free travel credits! Where do I enter my Airbnb Promo code? There is no need to enter any promo code on Airbnb. As the Airbnb first time discount is automatically applied when you check out. Does this Airbnb discount code work all over the world? Just like how Uber is taking over, Airbnb rentals are soon taking homes by storm and it is now pretty easy to find apartments to rent out pretty much all over the world, so it doesn’t matter if you are in Vietnam, South Africa or India, You can use this Airbnb Discount! So to answer the question YES it does works in most parts of the world and I’ve used Airbnb’s to rent out apartments in almost all my travels and so will the Airbnb coupon codes. How do I use my Travel Credit for my Airbnb travels? Using your credit for Airbnb is quite simple. Keep in mind the travel credit (up to $40) is only good for first-time reservations. Also, the reservation total must be over $75 or depending on where you are traveling to but that’s the only catch. In my experience, it’s never been a problem to avail. All you need to know if it’s for first time reservations and reservations over $75 and you will automatically earn the $40 at checkout. 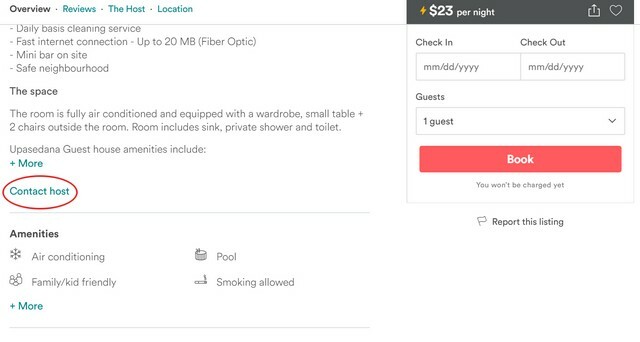 You will see your Airbnb promotion applied as a discount on the price breakdown tab of your booking. Airbnb is my favorite place to book accommodation online, you can book everything from houseboats in India to luxury tents in the middle of the Saharan desert to normal apartments complexes all around the world. I did a recent check of my travels in 2018 and out of the 365 days of 2018, I’ve spent over 300 of those in Airbnb’s! It simply makes getting accommodation and apartments around the world super easy and convenient thanks to its review system and great support you can rest assured you will get what you pay for. However recently I found Airbnb prices to be rising so in this article I’m going to share the ideas and strategies I use to get discounted Airbnb stays. Why use An Airbnb Coupon Code anyways? Why not? Who doesn’t like a good ol’ discount on their bill? It’s something that drives sales in some businesses but what’s different about Airbnb coupon codes is that they have no fluff and it’s super easy to avail them. There’s literally no strings attached! Moreover, if you’ve been traveling for a while or are thinking about traveling you might be aware of how expensive it can get! In fact, accommodation makes up a huge chunk of the expenses whilst traveling so it’s evident to reduce accommodation costs if you want to travel without breaking the bank! But traveling has really changed from what it used to be before back in the past hotels were a common choice of accommodations amongst travelers. You were restricted to only a few choices and much of them weren’t delivering much value for the money. Fortunately, we live in a world that has evolved in almost every industry especially with the advent of Airbnb that brought a brilliant twist to the traditional bed and breakfast avenues of accommodation. Airbnb is definitely one of the most unique ways to book accommodation whilst traveling without burning a hole in your pocket. The experience is simply unique as you get to live in a local’s home and also experience the culture like a local and is also really quite cheap! but you already know that in fact, you’re probably reading this not to learn about how great is Airbnb but more about how you can bag those crazy discount deals off Airbnb’s via coupon codes or credit! After months on the road traveling through many many countries, I’ve put together an ultimate guide to use Airbnb coupon codes so that you can travel cheap! You’re basically saving yourself a ton of money and invaluable hassle by reading this article. Airbnb has great filters that allow you to easily pick and choose the features you absolutely certainly need as well as those that you want! It is the first thing you to want to do when you begin your search on Airbnb for a home rental. You need to make sure your settings are correct and configured to what best suits your needs. Party size: First, you need to put in how many people you will be traveling with so you don’t book too many or too few beds. Note: You may notice that the price may increase with the more people in your group. Airbnb type: You will get a whole variety of features on Airbnb’s from basic amenities like Wi-fi to picking a pet-friendly home. Airbnb also gives you the option to choose between the different types of accommodations that you may want from an “entire house” to a “shared room” or even a private room in a shared home etc. Many times when you start choosing different prices and getting more choosy with your Airbnb rental you trigger an algorithm and the Airbnb’s website will automatically widen your location search to help find you even more rentals. So, be sure to pay special attention to the map and location details like landmarks of the places you are looking at. This will make sure your rental is exactly where you want it to be located. 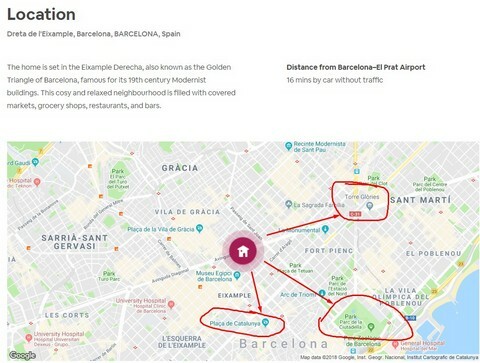 Due to the rise of Airbnb, recently I’ve heard a few people mention that they’ve ended up booking places that looked perfect on the picture but turned out to be in a really bad part of town so be sure to use the Map features in Airbnb to pick a good location. You can also use a site like Hoodmaps.com to find good neighborhoods in countries and cities you’ve never been to! The number one factor I look for when choosing my Airbnb rental is whether it has reviews and a good amount of them. Generally, I try to book Airbnb’s with at least 10 or more positive reviews, but even that is on the low end usually for a good Airbnb rental. I have only booked one Airbnb in the part that had no reviews before and it was a huge gamble that fortunately turned out to be great! Note: When a property is new and doesn’t have any reviews the host may a much lower price for the first couple of guests. and can even offer a much better experience so be sure to grab the new ones if you come across one. Everyone has to start somewhere! It’s surprising how few actually do read them and what you can find upon just reading the reviews for a few seconds. Sometimes the reviews can tell you something you probably wouldn’t know from the listing description as it’s always going to be in favor of the rental. Now that you have found a place with a whole lot of reviews you will need to actually read the reviews. Make sure there are a good amount of positive and that good things are being said about both the host and also the actual property. Note: Do leave a review of the place if you’ve stayed there it helps build a better community. Check the reviews carefully to make sure it fits what you are looking for. Do you work online? well, then you might want to check if the reviewer mentioned fast wifi. Are you flying into the city earlier in the morning? Read the reviews to see how easy the check-in process is! Longterm Airbnb rentals are a great way to spread out your travel budget further over more nights at an Airbnb and can actually work out to be much much cheaper than staying in a hostel since hostels very rarely have any kind of long-term discount available. If you book Airbnb’s for long-term stays like a month or over a week you are instantly given discounts that can range all the way from 10% to 50%. When you find a place that you like if it’s not urgent and you can afford to not book it instantly scroll down to the contact host button and let the person know that you are interested in booking the place. If you mention that you planning on visiting for longer than a week or a month you will almost always be offered an additional discount on top of the default longer term discounts. BOOM! If you are trying to book a last minute place you can leverage the fact that if they don’t get you as a guest that the place might go vacant so you have the chips in your corner when it comes to the negotiating table. Also, it’s always good to chat your host before you book the place! One of my host in Albania waited up till 2 am to check in me after I caught an early morning flight, another one drove us over 50 km through the mountains, so it’s not always about getting the lowest price! Airbnb has implemented a new feature called “Instant book.” Meaning when selected you are only going to see places that you can instantly get a booking done. While this may be good for travelers who are closer to their travel dates it is greatly limiting your search results. Note: Airbnb’s system will automatically switch this on for you so you have to make sure to turn it off whilst on the Airbnb hunt. I hope you found our guide on using Airbnb Coupon codes and Airbnb Booking tips useful. If you follow the steps we mentioned diligently you will have no issue finding great Airbnbs and availing the best discounts on Airbnb in the future! So there you have it, these single strategies can literary help you save over $100 on your Airbnb stays! Now, what are you waiting for?